There is a high probability you have seen large restaurant, gas station or store signs while driving from state to state, which let you know that there are supplies, food, or gas near an exit. These signs are known as Pole Signs. Research has shown how pole signs are effective at attracting attention from a great distance. They perform like a beacon, which let you know about a particular business close by. Thus, if you are a business owner looking for a permanent pole sign showing customers where your business is located, then Shine On Signs & Graphics can help you determine the best course of action. 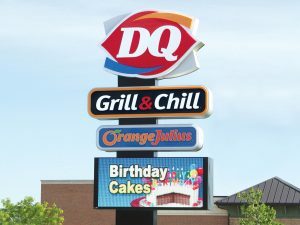 Shine On Signs & Graphics is a leading local signage company specializing in designing, producing and installing impactful, eye-catching pole signs. With our fast and friendly customer support, our dedicated team is ready for you. We will create the right pole for your business and location, helping you increase traffic to your business. Call Shine On Signs & Graphics today at (425) 336-4511 for a Free Consultation with a Pole Sign Expert! They are created by raising a large cabinet sign and reinforced by a singular pole. A lighted or illuminated pole sign is the best option if you open late. These signs tower more than 20 feet and known to attract potential customers from a great distance. They are not only impressive but durables as well. Pole signs represent a significant investment in your business, and a return on your investment is vital to keeping your business running. Our pole signs are designed to drive targeted audiences to your company for the products or services that you provide, giving your business the return on your investment quicker and more efficiently than you might have thought possible. If you are not sure whether you need a pole sign, contact, our on-site specialists will evaluate your location to help you ascertain what type of signage solution would best fit your business needs. Call Shine On Signs & Graphics at (425) 336-4511 for a free consultation! 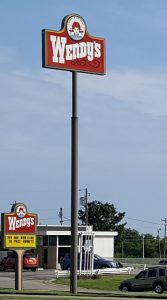 Similar to pole signs, pylon and tenant signs are signs that are raised up into the air. However, they are mostly installed above rooftops and often provided more information than a pole sign. The only limitation is that pylons are not as high as a pole sign. Pylon signs are usually constructed using heavier materials, and they have broad support at the base. 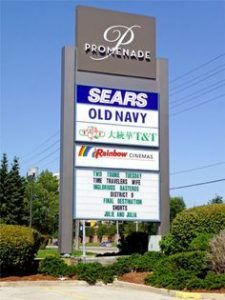 A tenant sign is a type of pylon sign but markets various businesses in a particular setting. They are ideal for open-air malls, markets, business parks, and business centers. If you are not sure that you need this also? Our expert signage consultants can help you determine the right signage for you. Call Shine On Signs & Graphics at (425) 336-4511 for expert advice and assistance! Shine On Signs & Graphics‘s pole sign experts are waiting for you. They are eager to design and install the impactful and eye-catching signage solutions you need to drive your business into the future. We handle everything from design to installation. Therefore, if you are looking for a dedicated and experienced locally based signage services, look no further than Shine On Signs & Graphics! This company does excellent work.